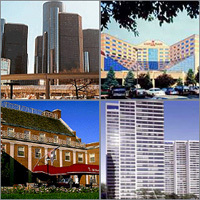 Compare discounts for Hotels Motels in Detroit, Michigan! Known as 'The Motor City', Detroit Michigan is an urban sprawl, where, not surprisingly, a car is the visitor's best friend. Home to the Ford Motor Company and the birthplace of the American Automobile culture, Detroit has seen years of economic prosperity followed by years of decay. In recent years downtown Detroit has been restored and is now alive again and Windsor, Ontario, across the bridge from Detroit has become Detroit's 'playground'. Detroit is not a blue color city anymore and nor is it a destination suitable only for automotive executives on a business trip - it is a cosmopolitan metropolis which can offer visitors anything the other North American cities can. Nestled in the quaint River Town area of Detroit, the Omni Detroit, a National Historic Landmark, reflects the beauty and sophistication of a European-style hotel.